For those individuals want to regularly support their congregation's ministry & mission, but are away from Church some Sundays, PAR may be a good option!! PAR may be a good option!! West and East Divisions of Stewardship have a three year goal of educating all pastoral charges in Newfoundland & Labrador about PAR. We believe that PAR is a low effort, low cost way to make a difference in congregational giving. 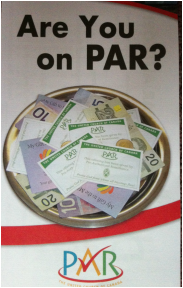 Want to learn more about PAR? Here is a NEW power point presentation on the PAR Program. It attempts to answer most of the common questions people have. Why not share with your congregation? Have a Question? Want More information? Interested in a PAR workshop?